A proprietary herbomineral formulation was formulated with four ingredients; a mixture of the minerals (zinc, magnesium, and selenium) and the herbal root extract ashwagandha. The aim of the study was to evaluate the immunomodulatory potential of Biofield Energy Healing (The Trivedi Effect®) on the herbomineral formulation in splenocyte cells, which were isolated from Biofield Treated mice. The test formulation was divided into two parts. One part was denoted as the control without any Biofield Energy Treatment, while the other part was defined as the Biofield Energy Treated sample, which received the Biofield Energy Healing Treatment remotely from seven renowned Biofield Energy Healers. The splenocyte cells were treated with the test formulation at concentrations ranges from 0.00001053 to 10.53 μg/mL and analyzed after 48 hours of treatment by MTT assay. The cell viability data showed safe concentrations up to 1.053 μg/mL with viability ranges from 69.22% to 123.88% in the test formulation groups. The expression of TNF-α was decreased by 4.82% at 1.053 μg/mL in the Biofield Energy Treated test formulation compared with the vehicle control. The level of TNF-α was significantly decreased by 2.02%, 4.92%, and 18.78% at 0.00001053, 0.001053, and 1.053 μg/mL, respectively in the Biofield Energy Treated test formulation group as compared to the untreated test formulation. The expression of IL-1β was significantly reduced by 83.65%, 92.15%, 27.30%, and 41.88% at 0.00001053, 0.0001053, 0.001053, and 1.053 μg/mL, respectively in the Biofield Energy Treated test formulation compared with the vehicle control. The Biofield Treated test formulation showed significant reduction of IL-1β by 17.26%, 92.61% (p≤0.001), 34.62% (p≤0.05), and 16.13% at 0.00001053, 0.0001053, 0.001053, and 1.053 μg/mL, respectively compared with the untreated test formulation. Additionally, the expression of chemokine MIP-1α was significantly reduced by 17.03%, 10.99%, 22.33%, 24.21%, 21.61%, and 30.67% at 0.00001053, 0.0001053, 0.001053, 0.01053, 0.1053, and 1.053 μg/mL, respectively in the Biofield Treated test formulation compared with the vehicle control. The MIP-1α expression was significantly reduced by 19.32% and 12.56% at 0.01053 and 0.1053 μg/mL, respectively in the Biofield Treated test formulation compared with the untreated test formulation. The overall results demonstrated that the Biofield Energy Treated test formulation significantly down-regulated the expression of TNF-α, IL-1β, and MIP-1α in the Biofield Treated mice splenocyte cells compared to the untreated test formulation. These data suggest that the Biofield Treated test formulation can be used for autoimmune and inflammatory diseases, stress management and anti-aging by improving overall health. Traditional systems of medicine widely use herbal drugs for many biological activities, but there are limited experimental studies based upon herbomineral formulations that combine herbs or plant extracts with minerals. Medicinal plants and minerals have been widely reported to have many healing properties including anti-inflammatory, anti-diabetic, and anti-stress activities, as well as improving overall health and the immune system [1, 2]. The literature also reports that certain cytokines / chemokines are involved in not only the initiation, but also the persistence of pathologic pain by directly activating the nociceptive sensory neurons . Ancient Ayurvedic physicians had also developed a certain dietary formulation to prevent various inflammatory disorders . Herbomineral based therapy is widely used for the prevention of various diseases and overall improvement of health. Additionally, holistic medicine / integrative medicine addresses not only the entirety of the body, but the mind and spirit as well . A proprietary herbomineral formulation that shows good efficacy with no adverse effects could constitute a major therapeutic improvement in the treatment of inflammatory and immunological disorders . Hence, the authors of this study used a herbomineral formulation as a basis to investigate ways to improve the immunomodulatory activity in splenocyte cells. The different types of immune cells such as dendritic cells, macrophages, and spleen cells all play important roles in stopping acute / chronic inflammation and in retrieving a steady state strategy through the secretion of immuno-modulating cytokines . These immune cells have been reported to be useful as cellular models for in vitro studies. Therefore, splenocytes were used to assess the effect of the test formulation on in vitro cell cultures. The test formulation is a proprietary herbomineral formulation containing four components viz. zinc chloride, magnesium gluconate hydrate, sodium selenate, and ashwagandha root extract. Each constituent of the test formulation is commonly used in nutraceuticals and various herbal medicines. In recent years, Biofield Energy Healing Treatment has gained rapid rapport as a holistic alternative and complementary medicine therapy that has significant impact on living organisms and nonliving materials without any adverse effects and in a manner that is more cost-effective than more conventional methods . The Trivedi Effect® - Biofield Energy Healing (TEBEH) is already renowned for its potential beneficial effects in a broad spectrum of scientific fields around the globe. Amidst many Complementary and Alternative Medicine (CAM) therapies, there have been an extensive number of scientific reports that show the beneficial effects of Biofield Energy Healing Therapy. Biofield Energy Treatments have been shown to have beneficial results in enhancing the immune function of cervical cancer patients using therapeutic touch , massage therapy , etc. Biofield Energy Therapies have been practiced worldwide recently with significant therapeutic outcomes such as enhanced personal well-being in cases of cancer patients , improved functional ability in cases of arthritis patients , and decreased pain and anxiety . The National Center of Complementary and Integrative Health (NCCIH) has recognized and accepted Biofield Energy Healing as a complementary and alternative medicine (CAM) health care approach in addition to other therapies, medicines and practices such as healing touch, massage, relaxation techniques, progressive relaxation, guided imagery, acupuncture, acupressure, natural products, special diets, homeopathy, hypnotherapy, deep breathing, meditation, yoga, mindfulness, Qi Gong, Reiki, Tai Chi, chiropractic/osteopathic manipulation, movement therapy, pilates, rolfing structural integration, cranial sacral therapy, Ayurvedic medicine, traditional Chinese herbs and medicines, naturopathy, essential oils, aromatherapy and applied prayer (as is common in all religions, like Christianity, Hinduism, Buddhism and Judaism). Human Biofield Energy has subtle energy that has the capacity to work in an effective manner [14, 15]. Biofield Energy Healing Treatments (The Trivedi Effect®) have had significant impacts in the transformation of living organisms and nonliving materials such as in medical science [16, 17], microbiology [18-21], genetics and biotechnology [22, 23], nutraceuticals [24, 25], agricultural science and livestock [26-29], and materials science [30-32]. This experiment was designed to evaluate the impact of Biofield Energy Healing (The Trivedi Effect®) Treatment on the designated herbomineral formulation for immunomodulatory potential after co-incubation with the isolated splenocyte cells from the Biofield Energy Treated mice. The ashwagandha (Withania somnifera) root extract powder (≥ 5% of total withanolides) was procured from Sanat Products Ltd., India. Zinc chloride and magnesium (II) gluconate hydrate were procured from Tokyo Chemical Industry Co., Ltd. (TCI), Japan. Sodium selenate was procured from Alfa Aesar, USA. Other experimental chemicals such as lipopolysaccharide (LPS), 3-(4, 5-diamethyl-2-thiazolyl) 2, 5 diphenyl-2 H-tetrazolium) (MTT), Roswell Park Memorial Institute (RPMI-1640), L-glutamine, penicillin, streptomycin, 4-(2-hydroxyethyl)-1-piperazineethanesulfonic acid (HEPES), 2- mercaptoethanol, concanavalin A (Con-A), rapamycin, NaHCO3, and EDTA were purchased from Sigma Chemical Corp. (St. Louis, MO), a subsidiary of Sigma-Aldrich Corporation. ELISA (enzyme-link immunosorbent assay) assay kits for all cytokines tumor necrosis factor alpha (TNF-α), macrophage inflammatory protein-1α (MIP-1α), and interleukin-1 beta (IL-1β) were purchased from R&D systems, USA. Fetal bovine serum (FBS) was purchased from GIBCO, USA. All other chemicals used in the experiment were of analytical grade available in India. The test formulation contained a combination of four ingredients viz. ashwagandha root powder extract, zinc chloride, sodium selenate, and magnesium gluconate. LPS was used as an inflammatory stimulant, while Con-A and rapamycin were used as reference standards for immunostimulatory and immunosuppressive action, respectively in the splenocyte assay. C57BL/6 male mice (8 weeks old, 22 gm body weight) were purchased from Vivo Bio Tech Ltd, Hyderabad, India and acclimatized for one week prior to the experiments. The rodents were maintained under controlled conditions with a temperature of 22 ± 3°C, humidity of 30% to 70% and a 12-hour light/12-hour dark cycle and rodent laboratory diet and drinking tap water were provided ad libitum. All the procedures were in strict accordance with the Guide for the Care and Use of Laboratory Animals published by the US National Institutes of Health. The approval of the Institutional Animal Ethics Committee was obtained prior to carrying out the animal experiment. The herbomineral test formulation was divided into two parts. One part was considered as the control formulation and the other part was defined as the Biofield Treated test formulation. The treated formulation was subjected to Biofield Energy Healing by Biofield Energy Healers (also known as The Trivedi Effect®). The Biofield Energy Treatment was provided by the group of seven Biofield Energy Healers (The Trivedi Effect®), all of which were remotely located in the U. S. A. Additionally, one group of animals also received the Biofield Energy Treatment per se by the Biofield Energy Healers under similar conditions, which were used to isolate the splenocyte cells as per the study design (Figure 1). These isolated splenocyte cells are referred to as the Biofield Treated splenocyte cells. This Biofield Treatment was provided for 5 minutes through the Biofield Energy Healers unique Energy Transmission process (The Trivedi Effect®), administered remotely to the test formulation. The treated herbomineral formulation was located in the research laboratory of Dabur Research Foundation near New Delhi in Ghaziabad, India under standard laboratory conditions. Similarly, the control formulation was subjected to “sham” healers for 5 minutes, under the same laboratory conditions. The sham healer did not have any knowledge about the Biofield Energy Treatment. After that, the Biofield Energy Treated and untreated test formulation were kept in similar sealed conditions and used in vitro on splenocytes for cytokines estimation as per the study design. Figure 1. Schematic diagram of the Biofield Energy Healing Treatment. The experimental study was divided into 7 groups. Group 1 consisted of splenocyte cells isolated from the Biofield Energy Treated animal without LPS and was denoted as the negative control. Group 2 served as the stimulant group that included similar cells with LPS. Group 3 included the same isolated splenocyte cells with LPS along with a vehicle (0.005% DMSO) and was denoted as the vehicle control. Groups 4 and 5 were defined as the positive controls i.e. Con-A (0.5 μg/mL) and rapamycin (1 nM and 10 nM), respectively. Groups 6 and 7 were denoted as the test item groups that included splenocyte cells (isolated from the Biofield Energy Treated animal) with LPS along with the untreated and Biofield Energy Treated test formulation, respectively, at concentrations 0.00001053 to 10.53 μg/mL. After 48 hours of incubation, supernatants were analyzed for the secreted levels of TNF-α, MIP-1α, and IL-1β using ELISA (enzyme-linked immunosorbent assay) as per the manufacturer’s instructions. Concentrations were determined in triplicate wells of each sample. The Biofield Energy Treated C57BL/6 male mice were sacrificed and their spleens were aseptically removed and ground by passing them through a sterile plastic strainer under aseptic conditions. After the cells were centrifuged twice at 1000 g for 5 minutes, erythrocytes were lysed by lysis buffer (0.15 M NH4Cl, 0.01 M NaHCO3, and 0.1 mM EDTA, pH 7.4) and then the cell pellets were washed twice with RPMI-1640 medium. Further, the cells were resuspended in complete RPMI-1640 medium (RPMI 1640 medium plus 10% fetal bovine serum, 2 mM glutamine, 100 IU/mL of penicillin and streptomycin, 15 mM HEPES and 50 mM 2-mercaptoethanol). The cell counts were performed using a hemocytometer and cell viability was determined using the trypan-blue dye exclusion technique with the results showing ≥95% of viable cells. The cells were cultured in 96-well tissue culture plates with 0.2 x 106 cells per well. They were incubated at 37°C in a humidified atmosphere of 5% CO2 for the indicated period . Splenocyte (0.2 x 106 cells per well) cells isolated from the Biofield Energy Treated mice were grown in 96-well culture plates using RPMI-1640 medium supplemented with 10% FBS, 100 units/mL of penicillin, and 100 μg/mL of streptomycin. LPS (50 ng/mL) induced splenocyte cells cultures were grown for 48 hours at 37°C in a humidified CO2 incubator (5% CO2). The effect of cytotoxicity of the test formulation was tested by treating cells with different concentrations of the test formulation in RPMI-1640 medium. The various concentrations of the test formulation were used i.e. 0.00001053 μg/mL to 10.53 μg/mL in the presence of inflammatory stimulus (LPS) for cell viability assay. The respective vehicle controls (DMSO) were kept in the assay for comparison. The effect of the test formulation at the concentration range of 0.00001053 μg/mL to 10.53 μg/mL was tested for cell viability assay using 3-(4,5-dimethythiazol-2-yl)-2,5-diphenyl tetrazolium bromide (MTT) assay. The number of viable cells were determined by the ability of mitochondria to convert MTT to formazan dye. Splenocyte cells isolated from the Biofield Energy Treated mice were cultured overnight in 96-well plates, at a density of 0.2 x 106 cells per well. After treatment with the test formulation and incubation period, the medium was removed. 20 μL of 5 mg/mL MTT was then added to each well and incubated for 3 hours further at 37ºC in a humidified 5% CO2 atmosphere. The cells were centrifuged and supernatants were removed. The cell pellets in each well were resuspended in 150 μL of DMSO to dissolve formazan crystals. The optical density of each well was read at 540 nm using BioTek Reader (SIAFRT/Synergy HT multimode reader, US). The concentrations that resulted in >72% viability were selected for subsequent cytokine estimation. The in vitro activity of the test formulations were estimated on the mice splenocyte cells for the production of TNF-α, MIP-1α, and IL-1β using enzyme-linked immunosorbent assay (ELISA). The ELISA plates were coated with an antibody in a coating buffer at the recommended concentration and kept overnight at 4ºC. After washing with PBS-T (PBS with 0.05% Tween 20), the plates were blocked with assay diluent for at least 2 hours at room temperature. A total of 100 μL culture supernatant from different experimental samples and standards were incubated overnight at 4ºC and, after three washes, biotinylated anti-mice cytokine (TNF-α, MIP-1α, and IL-1β) antibodies at the recommended concentrations were incubated for 1 hour at room temperature and the plates were incubated for 45 minutes at room temperature with gentle shaking. The plates were again washed 3 times and then 100 μL of horseradish per-oxidase (HRP)–streptavidin conjugate solution was added and the plates were incubated for 45 minutes at room temperature with gentle shaking. Next, the plate wells were washed 3 times as previous and 100 μL of 3,3,5,5'-tetramethylbenzidine (TMB) one-step substrate reagent was added, followed by a 30-minute incubation at room temperature in the dark. Further, 50 μL of 0.2 mole/L sulphuric acid was added to each well to stop the reaction and the plates were read for absorbance at 450 nm using a BioTek Reader (SIAFRT/Synergy HT multimode reader). Standards were run in parallel to the samples, and the concentrations were determined in triplicates for each sample [34-37]. Data were expressed as mean ± standard error of mean (SEM) and were subjected to Student’s t-test for two group comparison. Statistical significance was considered at p≤0.05. The cell viability assay of the Biofield Energy Treated and untreated herbomineral test formulation in the Biofield Treated splenocyte cells was examined after 48 hours using MTT. The cell viability data of the test formulation in the Biofield Treated splenocyte cells is shown in Figure 2. The untreated cells, LPS, and Con-A groups showed 100%, 171.43%, and 245.99% cell viability, respectively. The vehicle control group reported 100% cell viability and the rapamycin group exhibited 102.16% and 96.38% cell viability at concentrations 1 and 10 nM, respectively. The Biofield Treated splenocyte cells were treated with the Biofield Energy Treated and untreated test formulation at the concentrations range from 0.00001053 μg/mL to 10.053 μg/mL in the presence of LPS (0.5 μg/mL) for 48 hours. The effect of the test formulation on the viability of the Biofield Treated splenocytes showed an alteration at different concentrations after 48 hours as compared to the vehicle control. Further, the cytokines analysis was conducted using these concentrations. The percentage cell viability with LPS alone at 0.5 μg/mL was significantly increased by 71.43%, while con-A showed 43.49% cell viability at the same concentration as compared to the untreated group (splenocyte cells). The cell viability of the Biofield Treated test formulation was significantly increased by 8.71%, 22.16%, 6.90%, and 22.07% at the concentrations 0.001053, 0.01053, 0.1053, and 1.053 μg/mL, respectively as compared to the vehicle control. The Biofield Treated test formulation showed significantly increased cell viability by 48.35%, 33.93%, 31.36%, and 48.43% at the concentrations 0.001053, 0.01053, 0.1053, and 1.053 μg/mL, respectively as compared to the untreated test formulation. Overall, both the Biofield Energy Treated and untreated test formulations showed more than 69% cell viability up to the concentration 1.053 μg/mL. Thus, the concentration range of the test formulation from 0.00001053 to 1.053 μg/mL was selected for the estimation of cytokines (TNF-α and IL-1β) and chemokine (MIP-1α). Figure 2. MTT assay in the Biofield Treated splenocyte cells after 48 hours of treatment with various concentrations of the test formulation in the presence of 0.5 μg/mL of LPS. The absorbance of the MTT formazan was determined at 540 nm in an ELISA reader. Cell viability was defined as the absorbance ratio (expressed as a percentage) of the test formulation treated cells relative to the untreated vehicle cells. Values are represented as mean ± SEM. The Biofield Energy Treated splenocyte cells were treated with the Biofield Energy Treated and untreated test formulations at non-cytotoxic concentrations (0.00001053 to 1.053 μg/mL) for 48 hours. The effect of the test formulation on TNF-α secretion in the Biofield Energy Treated splenocyte cells is shown in Figure 3. The negative control (untreated cells), LPS, Con-A, and vehicle control group showed TNF-α values as 103.88, 157.90, 287.79, and 167.10 pg/mL, respectively. The Biofield Energy Treated test formulation showed a significant increase of TNF-α expression by 17.19%, 13.07%, 30.95%, and 22.35% at 0.00001053, 0.0001053, 0.001053, and 0.1053 μg/mL, respectively as compared to the vehicle control. However, the expression of TNF-α was decreased by 4.82% at 1.053 μg/mL, while it remained the same at 0.01053 μg/mL as compared to the vehicle control. Additionally, the untreated test formulation showed a significant increase of TNF-α expression by 19.61%, 18.92%, and 17.19% at 0.00001053, 0.0001053, and 1.053 μg/mL, respectively as compared to the vehicle control. Overall, the Biofield Energy Treated test formulation showed significant decrease of TNF-α expression 2.02%, 4.92%, and 18.78% at 0.00001053, 0.0001053, and 1.053 μg/mL, respectively as compared to the untreated test formulation. The expression of TNF-α was also altered at other concentrations of the Biofield Treated test formulation as compared to the untreated test formulation (Figure 3). Figure 3. Dose-dependent inhibition of TNF-α by the test formulation. For each concentration treatment, the level of TNF-α release was measured after 48 hours of treatment. The values are represented as mean ± SEM. The effect of the Biofield Energy Treated formulation in the Biofield Treated splenocytes for the expression of IL-1β secretion is shown in Figure 4. The untreated cells, LPS, Con-A, and vehicle control group showed values of IL-1β as 4.1 ± 2.88, 37.92 ± 1.21, 24.29 ± 2.06, and 35.79 ± 2.24 pg/mL, respectively. The Biofield Energy Treated test formulation exhibited better suppression than the untreated test formulation at 4 concentrations, which indicated that the Biofield Energy Healing enhanced its immunosuppressive property. The Biofield Energy Treated test formulation showed significant reduction of IL-1β expression by 83.65%, 92.15%, 27.30%, and 41.88% at the concentrations 0.00001053, 0.0001053, 0.001053, and 1.053 μg/mL, respectively as compared to the vehicle control. The untreated test formulation showed reduction of IL-1β expression by 80.25%, 14.28%, 37.78%, and 30.71% at the concentration of 0.00001053, 0.01053, 0.1053, and 1.053 μg/mL, respectively as compared to the vehicle control. Thus, the level of IL-1β was significantly suppressed by 17.26%, 92.61% (p≤0.001), 34.62% (p≤0.05), and 16.13% at 0.00001053, 0.0001053, 0.001053, and 1.053, respectively in the Biofield Energy Treated test formulation as compared to the untreated test formulation. Figure 4. Dose-dependent inhibition of LPS mediated production of IL-1β by the test formulation. For each concentration treatment, the level of IL-1β release was measured after 48 hours of treatment. The values are represented as mean ± SEM. *p≤0.05 and ***p≤0.001 (as compared to the untreated test formulation). The effects of the Biofield Energy Treated and untreated test formulations on MIP-1α expression in the Biofield Treated splenocyte cells are shown in Figure 5. The untreated cells, LPS, Con-A, and vehicle control group showed values of MIP-1α as 10.72 ± 5.81, 1250.27 ± 44.37, 386.78 ± 6.82, and 1340.24 ± 48.39 pg/mL, respectively. Both the untreated and Biofield Energy Treated test formulations demonstrated inhibition of MIP-1α at most of the tested concentrations as compared to the LPS stimulated group. Moreover, the Biofield Energy Treatment enhanced the immunosuppressive property of the test formulation at three concentrations. This was indicated by the higher extent of inhibition of MIP-1-α by the Biofield Energy Treated test formulation than the untreated test formulation. The results showed that the Biofield Energy Treated test formulation significantly reduced the MIP-1α expression by 17.03%, 10.99%, 22.33%, 24.21%, 21.61%, and 30.67% at 0.00001053, 0.0001053, 0.001053, 0.01053, 0.1053, and 1.053 µg/mL, respectively as compared to the vehicle control. Alternatively, the MIP-1α expression of the untreated test formulation was decreased by 16.74%, 18.14%, 23.05%, 6.06%, 10.34%, and 37.69% at 0.00001053, 0.0001053, 0.001053, 0.01053, 0.1053, and 1.053 µg/mL, respectively as compared to the vehicle control. The results further showed that there was a significant down-regulation of MIP-1α for the Biofield Energy Treated group at the three concentrations 0.00001053, 0.01053, and 0.1053 µg/mL by 0.35%, 19.32%, and 12.56%, respectively as compared to the untreated test formulation. Figure 5. Dose-dependent inhibition of LPS mediated production of MIP-1α by the test formulation. For each concentration treatment, the level of MIP-1α release was measured after 48 hours of treatment. The values are represented as mean ± SEM. Cytokines are derived from helper T cells (Th) and macrophages. They are also secreted from peripheral nerve tissue during physiological and pathological processes by resident and recruited macrophages, mast cells, endothelial cells, and Schwann cells. At the peripheral nerve injury site, the macrophages and Schwann cells gather and the nerve secretes cytokines and specific growth factors that are required for nerve regeneration. Localized inflammatory irritation of the dorsal root ganglion not only increases pro-inflammatory cytokines, but also decreases anti-inflammatory cytokines . Various herbomineral formulations have the potential to modulate the expression and activation of cytokines. In traditional systems of medicine, nutraceuticals and dietary supplements derived from herbs play important roles in inflammation (including joint destruction in osteoarthritis) . The US Food and Drug Administration (FDA) supports the regulatory definition of dietary supplements instead of nutraceuticals, and dietary supplements are used by more than half of the adult U. S. population . The use of herbomineral formulations to maintain or improve overall health has gradually increased throughout the world due to its potential long-term effectiveness, decreased toxicities, and lower costs. Novel anti-inflammatory agents derived from herbal extracts that stimulate or modulate the immune system can be used as innovative approaches to treat immunological diseases [41-43]. The test formulation presented in this study is a novel proprietary herbomineral formulation that consists of a mixture of the herbal root extract ashwagandha and the minerals zinc chloride, magnesium gluconate hydrate, and sodium selenate. All of the individual components comprising this formulation have already been proven to have immunomodulatory properties. Singh et al. (2007), reported that ashwagandha has inhibited TNF-α induced nuclear factor-kappa B (NF-κB) activation in human myelomonoblastic leukemia cells . The outcome of a study from Kruse-Jarres JD 1989, reports the significant role of zinc in both humoral as well as cellular immunity. This study also explored that in a state of zinc deficiency, the expression of cytokines like IL-1β, IL-2, IL-6, and TNF-α was enhanced. After zinc supplementation, the level of cytokines were restored in a dose dependent manner. The mechanism of action may reflect the ability of zinc to induce or inhibit the activation of NF-κB. The wide involvement of zinc in the immune system  includes an ability to influence the production and signaling of numerous inflammatory cytokines in a variety of cell types [46, 47]. Selenium is an essential trace element, plays an important role in protecting cells from oxidative stress and thus reduce the risk of cardiomyopathy, cancer, and immune disorders in humans [48, 49]. Magnesium sulfate plays a critical regulatory role in NF-κB activation, cytokine production, and disease pathogenesis . Inflammation is the first response of the immune system to infection, and is caused by cytokines such as TNF-α, IL-1, and IL-6 and by eicosanoids such as prostaglandin E2 (PGE2) . Lymphocytes/monocytes/macrophages are the key mediators of inflammation and are widely distributed in the body . Thus, inhibitors of these cytokines have been considered as ideal candidates for anti-inflammatory drugs. Mice splenocytes represent appropriate model systems to study immune responses, and were therefore utilized to investigate the anti-inflammatory effects of the newly developed proprietary herbomineral formulation. TNF-α has been identified as a key regulator of the inflammatory response. Literature supports that TNF-α can interact with two different types of receptors, tumor necrosis factor receptor 1 and 2 (TNFR1 and TNFR2), which are differentially expressed in cells and tissues that initiate both distinct and overlapping signal transduction pathways. These diverse signaling cascades lead to a range of cellular responses, which include cell death, survival, differentiation, proliferation, and migration . In this experiment, it is assumed that the down-regulation of cellular response might be accelerated due to the Biofield Energy Healing Treatment applied to the test formulation. The Biofield Energy Treated splenocytes (immune cells) were exposed to increasing concentrations of the test formulation from 0.00001053 to 10.053 μg/mL for 48 hours. 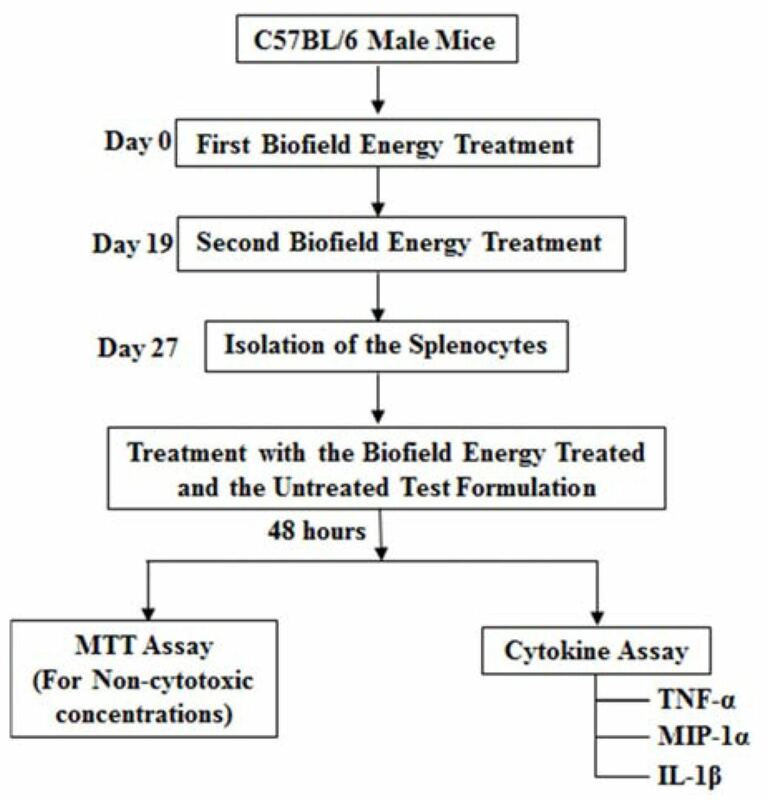 The splenocyte cells from the Biofield Energy Treated mice showed cytotoxicity at 10.053 μg/mL. The test formulation demonstrated the greatest potential for modulating the inflammatory response of splenocyte cells from the Biofield Energy Treated mice in vitro assays. There was a significant reduction of TNF-α, IL-1β, and MIP-1α levels in the supernatants of most of the tested concentrations. Several cytokines are deeply associated with inflammatory diseases. In particular, TNF-α and IL-1β are prominent contributors to chronic inflammatory disorders. Our data suggests that the test formulation modulated the function of the Biofield Energy Treated splenocyte cells. Further, the Biofield Energy Treated test formulation strongly inhibited the pro-inflammatory cytokines TNF-α, MIP-1α, and IL-1β. Therefore, these results suggest that the test formulation may inhibit the inflammatory responses of the Biofield Energy Treated splenocytes by modulating the signal transduction pathways. This effect may be the result of the specific inhibition of NF-κB, a transcription factor involved in the activation of many inflammatory mediator genes. Overall, the study results demonstrate that the Biofield Energy Treated test formulation showed better and significant inhibition of pro-inflammatory cytokines TNF-α and IL-1β and chemokine MIP-1α expression in the Biofield Energy Treated splenocyte cells as compared to the untreated group. In brief, the level of TNF-α was significantly decreased in the Biofield Energy Treated test formulation by 18.78% at 1.053 μg/mL as compared to the untreated test formulation. Moreover, the level of IL-1β was significantly reduced in the Biofield Energy Treated test formulation by 17.26%, 92.61% (p≤0.001), 34.62% (p≤0.05), and 16.13% at 0.00001053, 0.0001053, 0.001053, and 1.053 μg/mL, respectively as compared to the untreated test formulation. The expression of MIP-1α in the Biofield Energy Treated test formulation was significantly reduced by 17.03%, 10.99%, 22.33%, 24.21%, 21.61%, and 30.67% at the concentrations of 0.00001053, 0.0001053, 0.001053, 0.01053, 0.1053, and 1.053 μg/mL, respectively as compared to the untreated test formulation. Therefore, The Trivedi Effect® Biofield Energy Healing (TEBEH) administered remotely by the seven Biofield Energy Healers enhanced the herbomineral test formulation’s anti-inflammatory and immunomodulatory properties. Thus, the Biofield Energy Treated test formulation may act as an effective anti-inflammatory and immunomodulatory product, and it can be used as a Complementary and Alternative Medicine (CAM) with a safe therapeutic index for various autoimmune disorders such as Lupus, Systemic Lupus Erythematosus, Fibromyalgia, Addison Disease, Hashimoto Thyroiditis, Celiac Disease (gluten-sensitive enteropathy), Multiple Sclerosis, Dermatomyositis, Graves’ Disease, Myasthenia Gravis, Pernicious Anemia, Aplastic Anemia, Scleroderma, Psoriasis, Rheumatoid Arthritis, Reactive Arthritis, Type 1 Diabetes, Sjogren Syndrome, Crohn’s Disease, Vasculitis, Vitiligo, Chronic Fatigue Syndrome and Alopecia Areata, as well as inflammatory disorders such as Irritable Bowel Syndrome (IBS), Asthma, Ulcerative Colitis, Alzheimer’s Disease, Parkinson’s Disease, Atherosclerosis, Dermatitis, Hepatitis, and Diverticulitis. Further, the Biofield Energy Healing Treated test formulation can also be used in the prevention of immune-mediated tissue damage in cases of organ transplants (for example heart transplants, kidney transplants and liver transplants), for anti-aging, stress prevention and management, and in the improvement of overall health and quality of life. Mishra BK, Rastogi A, Shukla S (2012) Regulatory role of mineral elements in the metabolism of medicinal plants. In: Naeem M, Khan MMA, Moinuddin (Eds) Mineral nutrition of medicinal and aromatic plants. Medicinal and Aromatic Plant Science and Biotechnology 6 (Special Issue 1), 1-23. Velasco-Ramirez SF, Rosales-Rivera LY, Ramirez-Anguiano AC, Bitzer-Quintero OK (2013) Cytokines and the nervous system: The relationship between seizures and epilepsy. Rev Neurol 57: 171-177. Liu M, Dong J, Yang Y, Yang X, Xu H (2005) Anti-inflammatory effects of triptolide loaded poly (D, L-lactic acid) nanoparticles on adjuvant-induced arthritis in rats. J Ethnopharmacol 97: 219-225. Govindarajan R, Vijayakumar M, Pushpangadan P (2005) Antioxidant approach to disease management and the role of 'Rasayana' herbs of Ayurveda. J Ethnopharmacol 99: 165-178. Patel SS, Shah PV (2013) Evaluation of anti-inflammatory potential of the multidrug herbomineral formulation in male wistar rats against rheumatoid arthritis. J Ayurveda Integr Med 4: 86-93. Mosmann TR, Sad S (1996) The expanding universe of T-cell subsets: Th1, Th2 and more. Immunol Today 17: 138-46. Kyurkchiev D, Bochev I, Ivanova-Todorova E, Mourdjeva M, Oreshkova T, Belemezova K, Kyurkchiev S (2014) Secretion of immunoregulatory cytokines by mesenchymal stem cells. World J Stem Cells 26; 6: 552-570. Xie WR, Deng H, Li H, Bowen TL, Strong JA, Zhang JM (2006) Robust increase of cutaneous sensitivity, cytokine production and sympathetic sprouting in rats with localized inflammatory irritation of the spinal ganglia. Neuroscience 142: 809-822. Akhtar N, Haqqi, TM (2012) Current nutraceuticals in the management of osteoarthritis: A review. Ther Adv Musculoskelet Dis 4: 181-207. Halsted CH (2003) Dietary supplements and functional foods: 2 sides of a coin? Am J Clin Nutr 77: 1001S-1007S. Aggarwal BB, Prasad S, Reuter S, Kannappan R, Yadev VR, Park B, Kim JH, Gupta SC, Phromnoi K, Sundaram C, Prasad S, Chaturvedi MM, Sung B (2011) Identification of novel anti-inflammatory agents from Ayurvedic medicine for prevention of chronic diseases “Reverse Pharmacology” and “Bedside to Bench” Approach. Curr Drug Targets 12: 1595-1653.